﻿ Continuing to Meet the Standard | Levy’s Machine Works Ltd.
Calgary-based precision machining and manufacturing company Levy’s Machine Works Ltd. recently passed its annual ISO 9001 surveillance audit with flying colours, not to mention zero non-conformances. In doing so the Calgary-based precision machining and manufacturing company also transitioned to the most recent version of the international standard, ISO 9001:2015. 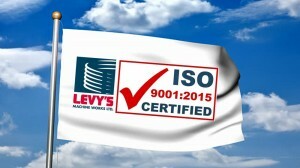 As well as demonstrating its ability to follow the guidelines of the ISO 9001 standard, theonce again proved Levy’s ability to successfully meet customer requirements as well as all statutory and regulatory requirements. Continual improvement, product quality and customer satisfaction have always been the focus for the 37th year old business, and this international standard serves to further reinforce its reputation as an outstanding supplier of precision machined components.